The United Nations has demanded a full investigation into allegations of politically motivated killings of opposition figures in Rwanda in the run-up to the country’s election next month. The UN secretary-general, Ban Ki-moon demanded the inquiry in a meeting with Rwanda’s president, Paul Kagame, after a series of attacks on figures unpopular with the regime in Rwanda and in several other African states. Last week a senior opposition figure was beheaded near the southern Rwandan city of Butare, while a lawyer who had participated in genocide trials at a UN tribunal was shot dead in Dar es Salaam. Last week’s killings come hard on the heels of the attempted murder in Pretoria, South Africa, of a former senior Rwandan general who had fallen out with Kagame, and the murder in the Rwandan capital, Kigali, of a journalist investigating that shooting. Two opposition newspapers in Rwanda have been banned from publishing, while opposition politicians and human rights organisations have been harassed by the authorities. The Spanish prime minister, José Luis Rodríguez Zapatero, pulled out of a scheduled meeting with Kagame on Friday after receiving a petition alleging he had violated human rights. The meeting in Spain was the first to be held by a group of experts named last month by Ban to supervise the UN’s Millenium Development Goals, which aim to halve extreme poverty by 2015. 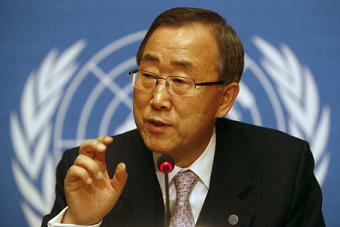 Ban had prompted protests by naming Kagame and Zapatero as his co-chairmen. “The prime minister yesterday received a petition from various political groups saying that they didn’t think it was appropriate for the meeting to take place,” the deputy prime minister, María Teresa Fernández de la Vega, told Spanish television. Rwandan government figures have strenuously denied orchestrating a campaign of violence and intimidation and offered alternative explanations for several of the attacks, including robbery and a vengeance killing related to the genocide trial. The 1994 genocide – the murder of an estimated 800,000 Tutsis and politically moderate Hutus, ended by a Tutsi military intervention headed by Kagame – has continued to dominate the politics of the still fragile country. After ending the genocide, Kagame was hailed as a hero, but critics have since accused him of trampling on political and press freedoms. Despite remarkable progress in stabilising the country, tension has been growing in Rwanda since 19 February, when a series of grenade explosions killed three people and injured 30 more in Kigali. Some analysts attributed those attacks not to Hutu extremists but to Tutsi dissidents within Kagame’s own party. The former general who was wounded in Pretoria, Faustin Kayumba Nyamwasa, was publicly accused by Rwanda’s chief prosecutor of being behind the grenade attacks, while the journalist murdered in Kigali, Jean Leonard Rugambage, was investigating government links to his attempted murder. Since then, however, a number of other senior military figures have been arrested – allegedly those harbouring rival political ambitions to Kagame – suggesting splits within Kagame’s regime. Among them was Brigadier-General Jean Bosco Kazura, the head of the country’s football federation, who was taken into custody for making an “unauthorised” trip to South Africa. The government reportedly suspected that he had travelled to meet prominent Rwandan exiles living there. The case of the decapitated politician, André Kagwa Rwisereka, is also instructive. He belonged to Rwanda’s Green party, which was set up by Frank Habineza, a Tutsi exile from Uganda, like Kagame, who is also a former member of Kagame’s RPF. The party was prevented from running in the elections. Habineza, who says he has also received death threats, complained last week that the government had refused to give opposition leaders protection. “It is very sad and shocking that we heard that our vice-president was murdered. His head was almost cut off and he was also stabbed in the chest. We would like now to call upon the Rwandan government and the national police to carry out a thorough investigation,” he said.